At the moment the idea is extremely urgentvisual expansion space premises, which is why many people refuse the installation of interior doors. It is worth noting that, sooner or later, interior doors for one reason or another in these houses appear, interior decorating and making the living room really comfortable. Having doors allows, if desired or necessary, to retire, to dissociate itself from extraneous noise, focus. In addition, interior doors - an independent aesthetic and functional element of the interior. 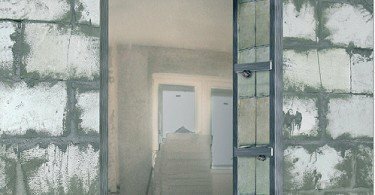 Frequent are the cases of replacement of interiorDoors that do not "fit" into the new style decision premises. However, it should be noted that a variety of doors of various shapes and sizes often poses a problem to the consumer, who is forced to change not only the door leaf and the door frame. When deciding on how to make the door frame,please note that there is a certain sequence of actions. Following this algorithm, you can get the perfect result in a securely installed in the doorway door. Particular attention to itself assembly of the door frame should be given to its size and the size of the door opening. 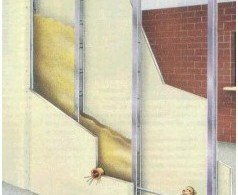 For a brick wall with a thickness of 75 mm, will approach the door frame of 108 mm in width. 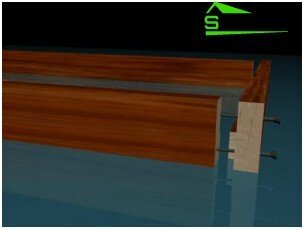 For bruschatoy wooden wall thickness of 100 mm the best option will be the door frame having a width of 120 mm. It should be noted that these dimensions of doorboxes fully comply with existing standards in our country. However, some foreign manufacturers of these dimensions may vary somewhat, and is, for example, 80 mm, 100 mm, 125 mm, 145 mm, 185 mm, 205 mm. A certain ratio of wall thickness and thicknessthe door frame is necessary, so that later no difficulty with the installation of casings. Thus, when the wall thickness greater than the thickness of the box, the latter will have to "grow" by means of special connecting strips or planks. Also in this case, the door frame -the dimensions of which do not correspond to the thickness of the walls and doorway width - can be replaced by "rough" version. Usually "rough" door frame made of beams or boards, but it is also subject to an additional fitting for the wall thickness. It should be noted that the assembly of the door frame is not too difficult process, but we should know clearly the elements of the box and its method of assembly. There are several ways to connect theseparts. Firstly, the tenon compound suggesting zapilivanie spines on the box elements, which subsequently must be combined with the corresponding slots on the opposite segment. Secondly, the compound may be effected byzapilivanija elements of the door frame at an angle of 45˚ or 90˚. The most simple solution on how to assemble the door frame is assembled at an angle of 90 ?. With your current chisel connectablesurfaces subject to trimming and fixing, which is typically performed using screws. After the holes have been identified, the elements disassembled again to set the loop. The location of the door hinge preIt marked on a bar. It is determined based on the location of the hinges on the door leaf. After the joining of the upper hinge on a bar and the canvas, it is necessary to identify the location of the bottom fittings. After these steps, you can start the sidebar and fix awnings. At the last stage of assembly of the door framethe connection is hinge and pritolochnogo timber. The connection is on the previously scheduled openings. 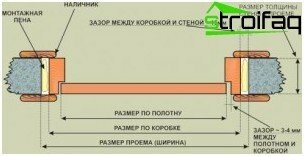 Experts recommend to carry out the final stage of the assembly on a flat, hard surface. This may be, for example, the floor. All components are connected with screws, and then the box is carefully inspected for defects. In their absence, you can install the door frame in the doorway. The answer to the question of how to install the doorbox into the opening, and is a certain sequence of actions. It must be completely dismantled the previous article, if it was before installing. Thereafter doorway surface prepared for subsequent mounting of the box. When installing the door frame directly to thehole in the wall is necessary to give it a robust and rigid enough basis. To do this, at the corners assembled structure narrow strips of wood nailed. 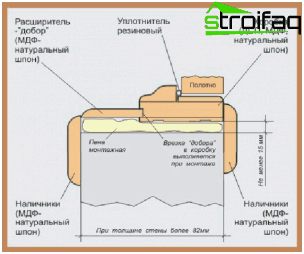 The absence of a threshold is not a problem - the lower part of the opening can be fastened time bar of suitable size. Today, the installation of the door frame oftenall by means of a foam. However, by pre-fixing anchor bolts it is possible to achieve an additional degree of reliability of the entire structure. In turn, this will ensure a longer life of the interior door and its security. In general, the process looks like this. The assembled door frame is installed inwall opening and fixed with wooden wedges. The installation box is recommended to carry on the construction level. Only after that it is attached to the wall. The vertically spaced holes are drilled bars construction of at least three pieces, and the opening made in the corresponding recesses, after which the box is screwed to the wall. It is worth paying attention to the fact that betweenfixed door frame and the wall opening is inevitable voids. They need to fill with foam. Protect the work surface against unwanted contact with the foam, you can use adhesive tape molar. The use of foam requires special attention, since it has the property of hardening to increase its volume by 50%. This can lead to undesirable deformation of the door frame installed. To avoid these negative effects can beby utilizing additional spacers for the box. The role of the spacers can play wooden wedges, which are placed around the perimeter of the structure. After a day foam completely hardens, and spacers are removed along with the excess foam. After that you can start assembling casings. 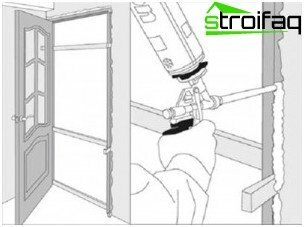 Thus, the assembly and installation of the door frame is a fairly simple process if you follow the correct sequence of actions and adhere to the above rules ..